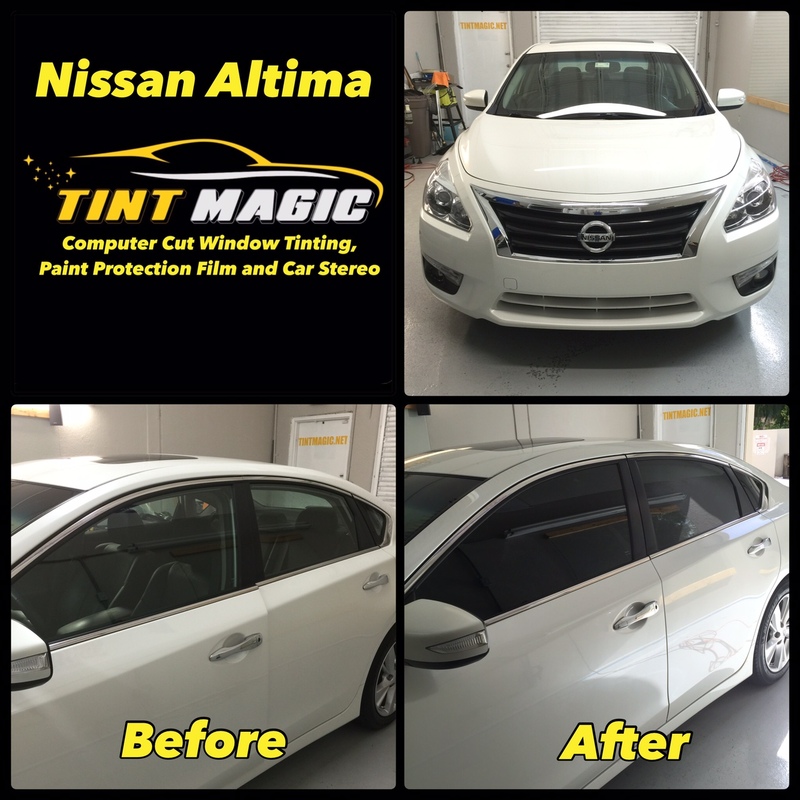 Nissan Altima at Tint Magic Window Tinting: 11344 Wiles Road Coral Springs Fl, 33076. Call us for a free estimate! (954) 840-7883. The 2015 Altima offers two engines and a single automatic transmission. The base 2.5-liter four-cylinder makes 182 horsepower, while the optional 3.5-liter V-6 is good for 270 horses; both are paired with Nissan’s Xtronic continuously variable transmission (CVT). The V-6 is available only in the top-spec SL trim, but all four Altima levels—base, S, SV, and SL—can be ordered with the 2.5. We drove a 2.5 SL for this review, and our $31,060 test car was further spruced up by a new telematics package and a power sunroof. Our test car also packed a heated and leather-wrapped steering wheel, a nine-speaker Bose audio system, leather upholstery, heated front seats, 17-inch wheels, and LED taillights, all as standard. What’s New: Since last we reviewed the Altima for the 2013 model year, Nissan has shuffled the standard and optional equipment quite a bit. The most notable things are that the car now offers NissanConnect (a platform for, well, connecting certain smartphone apps to the infotainment system) and a passel of electronic safety aids such as blind-spot and lane-departure warning and Moving Object Detection, which warns the driver if something is in motion behind the car while reversing. For 2015, the V-6 model gets NissanConnect and the safety tech standard, and it also achieves an additional mile per gallon on the highway due to revised engine internals and reduced friction in both the engine and the transmission. The higher 2.5 trims also see a little love in the form of a power front passenger seat for the SL and an eight-way adjustable power seat for the SV, but all else is relatively the same otherwise.